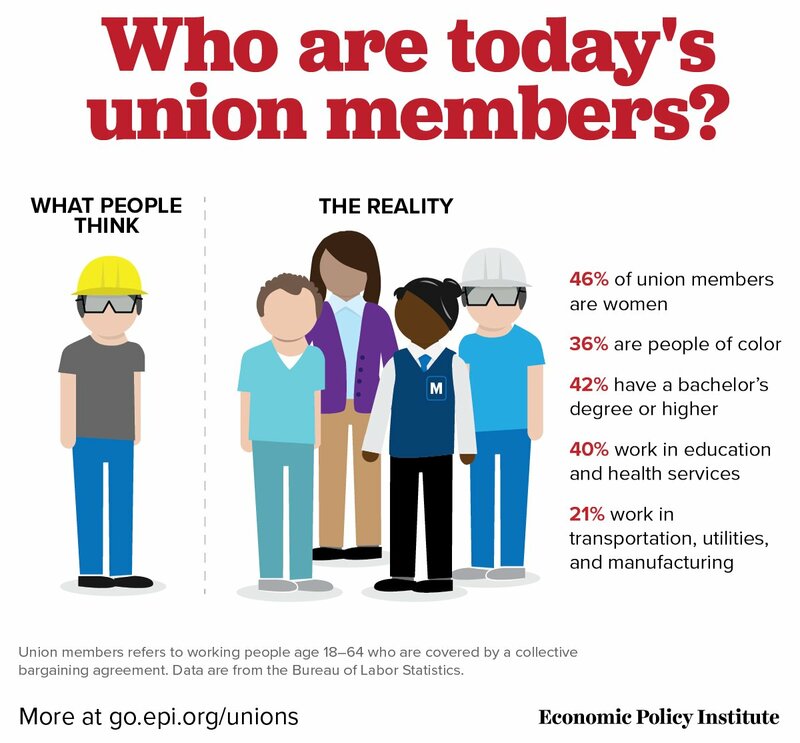 Who are today’s union members? As Labor Day approaches, we honor the labor leaders and working people throughout history who have fought for labor protections and a voice on the job. In 2017, unions continue to fight for labor standards and higher wages in traditionally unionized sectors, like manufacturing, along with new industries, like digital journalism. Today’s unions are diverse. 42 percent of union members are women and more than a third are black, Hispanic, Asian, or other nonwhite workers. Together, about two-thirds of working people age 18 to 64 and covered by a union contract are women and/or people of color. As of 2016, roughly 10.6 million of the 16.3 million American workers covered by a union contract are women and/or people of color. Union members are also represented at all levels of education. More than half of union workers age 18 to 64 have an associate degree or more education and about 42 percent have a bachelor’s degree or higher. Today’s union members include graduate students, dental hygienists, firefighters, television writers, engineers, security guards, hotel workers, digital journalists, and professional athletes – joining working people in more heavily unionized sectors like public administration, education, health services, and transportation. When unions are strong, even non-union workers benefit. Unionized workplaces set industry-wide safety standards. Unions also fight for paid sick days and a higher minimum wage. Finally, non-union workplaces have to compete with the wages and benefits of unionized workplaces, driving up the wages of non-union workers.